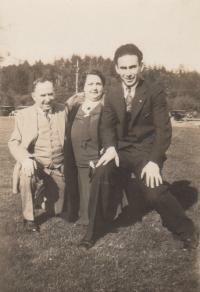 Arnott and Vederoff Ancestors - Morris Vederoff on right, with his mother- and father-in-law, Lewis and Maria Tunik. Photo taken about 1932. Morris Vederoff on right, with his mother- and father-in-law, Lewis and Maria Tunik. Photo taken about 1932.